Back in 2011, Friendly Dictator made yet another addition to his shelf of fun minigames, that one being Crazy Lakitu! Not to be confused with a rather infamous fangame with the same name that was released before then, Friendly Dictator's latest minigame at that time has you in the cloud of a Lakitu, one that just happened to be the unfortunate target of an endless barrage of Bullet Bills that are being fired by who-knows-who! To defend himself, Lakitu has an endless-as-well supply of Spiny Eggs that he can use to hit the many flying Bullet Bills and their relatives. 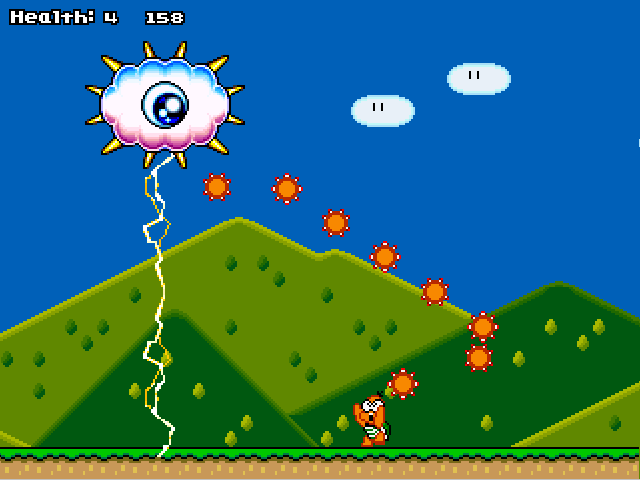 In addition to that, power-ups will rain down from above, which have various effects. Some are helpful, while some may not be so helpful, and they all make the battle even crazier and more fun! As you survive, you earn points and the bullets get faster and faster; they'll eventually get so fast that they seem to zip through like real bullets! It was fun, but it was just that, aside from keeping track of your best record. Becuase of that, along with the fact that it's rather difficult to survive the constant attacks once they get really fast (which happens rather quickly), your attention may not last very long. In 2012, the crazy Lakitu and those darn Bullet Bills returned with Crazy Lakitu DX! This spiced-up edition brings a lot more polish along with many nifty additions, such a boss-rush-style story mode, lots of achievements, excellent song choices, an unlockable mode, and some cool Easter eggs! Crazy Lakitu DX also had online high scores, although the system has been down for a while. Nevertheless, this update has much more to do than before and as a result holds a lot more replay value. If you're in the mood for a destruction derby, Crazy Lakitu DX may satisfy your maniacal needs! @Q-Nova Thanks for writing this topic! Crazy Lakitu DX was a fun little game that deserves some love. If @Friendly Dictator ever wants to update this game, consider using MFGG's built-in high scores system. @VinnyVideo You're welcome! Yeah, Crazy Lakitu DX was quite enjoyable; it was one of the two first games I downloaded from MFGG, the other being Gravity Goomba. I remember when I had lot of trouble fighting against Kracko and then the big cookie monster, although after many tries I eventually managed to take them down. I also remember playing the game in October, which brought...something rather neat. I thought we were gonna have a special name for the throwback awards...?